Do I have to register in order to use services of ZooBurza.eu? How can I post an ad on ZooBurza.eu? How can I attach photos to an advertisement? How to edit a published ad? How long will my ad be published on ZooBurza.eu? What steps should I take if I suspect a fraudulent seller? What are the typical signs of fraudulent seller? What are the typical signs of fraudulent buyers? ZooBurza.eu is a free advertising portal publishing the intended interest of buying, selling and adoption of pets, plants and herbs, pet supplies and related services that may be due to their nature classified into one of existing categories. The use of basic services on web portal ZooBurza.eu are 100% free of charge, however some high standard supplementary services may become charged in the future, such as advertisements advantage over others, and so on. No. You can post advertisements on ZooBurza.eu answer them via the contact form and add them without registration. 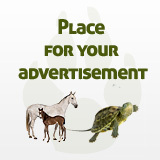 If you want to add an advert as an unregistered user, click and select the "Post an ad" in the right column and fill in the information on the subject of advertising. Upon submission of the form, your add will immediately appear in the listing. If you wish to place your ad as an registered user, login first and then click the option "Post an ad" in the right column and fill in the information on the subject of advertising. After submitting the form, your add will immediately appear in the listing. Publication of advertisements on ZooBurza.eu and registration is FREE. Information about attaching photos is present during the process of publication of the advertisement. Simply follow it. The procedure for uploading photos is simple, in each advertisement an unregistered user can attach up to 4 (four) photos, however upon registration and logging in you are allowed to attach add up to 7 (seven), thus the registration is recommended. Publishing photos on ZooBurza.eu is FREE. If you are a registered user, your ads can be edited through the item "My Ads" in the user menu in the right column. If you add an ad as an unregistered user, your ads cannot be further edited. Ads are kept published according to duration set by the advertiser - from weeks, month to infinite duration if it was chosen so. Upon the expiration is the ad removed. If you are a registered user, you can remove your ads after logging in through the administration of ads under the name “My ads”, which can be found in the user menu in the right column. If you have submitted an ad as an unregistered user, you can remove your ad via the link you have received by the e-mail after the submission of the ad. If you are unable to find that e-mail, please contact us via the form on our website. We believe that the safest way to realize your transaction is by personal meeting with the seller. That way you can inspect the exhibit before you make the payment and decide whether your interest in that particular exhibit lasts. If you believe that the ad is fake or fraudulent, please notify us via the menu option "Report this ad", or contact us via the form on our website. * Popular expansive exhibits offered for low price. Union or other similar service. * Disagrees to use payment services with security. * Uses other billing address then the address attached to the advertisement. * Recommends unknown payment service. * Ignores number of phone calls or e-mails. * Repeatedly have no excuse why you have not received the item. * Is unwilling to provide tracking number for the shipment. * Asks you to transfer money to their account in order to cover various fees. * Demands to pay only half and declare to pay the other upon receiving the item. * Does not include phone number. advised not to transfer the money. * Recommends an unknown escrow account or payment service. * Orders a big quantity of goods to a place abroad. © 2011 - 2019 ZooBurza.eu, all rights reserved.